We have installed our DBS system for the first time at Fresh Wharf, a former brown-field industrial site in Barking, to stop the estate having to regularly replace a bus shelter which was previously being shattered by stone chips thrown up by passing vehicles on the adjacent A406 North Circular Road. Meanwhile the Chobham Academy, a legacy school built on the London 2012 Olympic Park, has chosen our DBS acoustic fencing to reduce the impact of noise from the Tube line that runs alongside the school boundary. 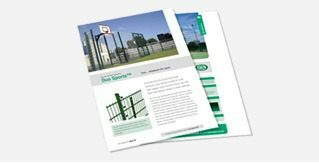 The mixed-plastic-waste panels can be incorporated onto any of Zaun’s extensive range of fencing post and panel systems, so specifiers can tailor the solution to their precise needs. The panels are easy to erect, very low maintenance and suffer very low repair needs, significantly reducing the whole life cost of the fencing system. The Home Office has tested the panels to PBAS V 2.1 EP BASE Standard for resisting manual attacks, while their V50 is 344.6m/s against .22 17gr 1.1g skirted fragment simulating projectiles to STANNAG 2920. The panels’ impressive acoustic-loss properties have been rated B3 with a 36dB loss under BS EN 1793-2. They have also been subjected to 500-hour accelerated weathering, fire tested and achieved an R-value of 0.98 in smoke and toxicity tests according to BS 6853:1999: Annex B.2, within the most stringent regulations set out for use on the London Underground.